Optimizing your content marketing for search can feel like a game of Clue: a process of trial and error, where you may encounter a lot of false starts and dead ends before finding the right path to success. But there are more strategic ways to plan and manage your SEO efforts. 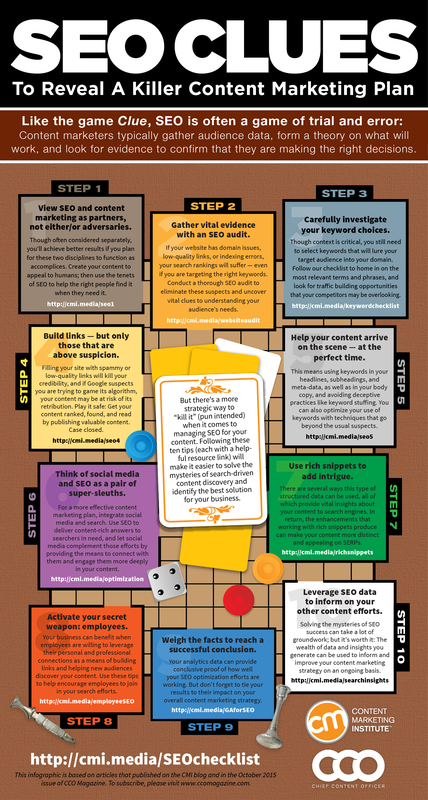 Following the 10 steps outlined in our SEO Clues infographic will make it easier to solve the mysteries of search-driven content discovery and identify the best options for your business. Please include attribution to contentmarketinginstitute.com with this graphic.